Here's how you get to Lucerne. If you are there and and want to know how to get get around, click here. In the city we recommend public transport, even for car enthusiasts: it's safe, reliable and gets you everywhere within no time - without having to worry about traffic jams and parking slots. 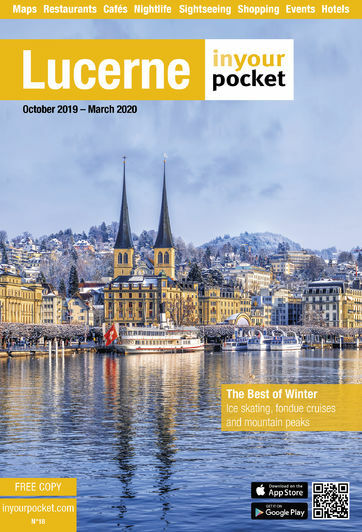 Lucerne is easiest to reach from Zurich International Airport (ZRH), which has by far the most international connections compared to the two alternatives: EuroAirport Basel Mulhouse (BSL) and Airport Bern-Belp (BRN). Zurich airport handles around 700 flights a day going to over 170 destinations worldwide. You can find ATMs and switzerlandinfo desks at arrivals 1 and arrivals 2 just after you pass customs. There is a big public shopping area with most shops open from 08:00 - 21:00 and free Wi-fi for the first 2 hours, just connect your device to ’ZurichAirport’ and follow the instructions in your browser. Direct trains to Lucerne leave Zurich airport every hour and take 62minutes, trains that take just 5 minutes longer leave inbetween (chane train at Zuzrich HB). The train station is actually within the airport, on level -2 of the airport centre, where the main shopping area and check-in 3 are located. Train tickets can be bought at the counters or at the ticket machines (switch them to English on the first screen) next to the stairs leading down to the platforms. Lucerne's main train station is right in the centre of town, with the lake and the KKL to one side and the old town just a few minutes' walk away. International and domestic connections leave and arrive here. At the station you will find ticket offices, tourist information as well as shopping. Buses and taxis depart just in front the station. Of the suburban train stations, the one at the Transport Museum (Verkehrshaus) is most likely to interest you. You can buy train tickets (also available at the many ticket machines), tickets for public transport in Lucerne and also change money at the ticket office in the main hall . For time tables and tickets refer to www.sbb.ch or call +41 900 300 300 (1.19Sfr/min). Some international long-distance bus connections are available from Lucerne. Since June 2018, there are, for the first time, domestic intercity buses in Switzerland, offering cheap, but slow connections. Currently, only Basel and Ticino are well connected from Lucerne. Visit www.swiss-express.ch.for more information. Buses arrive and leave at Inseliquai 10, just to the east of the main train station. The Swiss motorway A2 connects Lucerne to the Gotthard and Italy to the south and Bern to the north, the motorway A14 comes from Zurich. This makes getting to Lucerne by car easy, but parking is scarce and expensive. For overnight parking you can try finding a spot in the so-called blue zone in residential areas - parking there is free from 19:00 - 08:00, indicate your arrival time on your parking disk. In car parks parking costs approx. 20 - 50Sfr a day. Driving in Switzerland is generally easy. If you’re using the motorways you have to buy a vignette for 40Sfr (available at petrol stations and post offices). Remember that pedestrians on zebra-crossings without traffic lights always have right of way, as do trams. Cars must have their headlights switched on at all times. The legal alcohol limit for drivers is 0.05%, which should allow you to have roughly one glass of beer before driving. The standard speed limit is 50km/h in urban areas, 80km/h outside towns and 120km/h on motorways. In residential zones in Lucerne, the speed limit is often 30km/h. Fines are high and yes, Switzerland has agreements with many European countries to make sure you pay the fine even if you have a foreign number plate. You may use your home driving license in Switzerland as long as it is valid - if the licence is a non-EU and in a language not spoken in Switzerland or English, it is recommended that it be accompanied by an international licence.